I am unsure why I picked up this book, or where it was recommended to me. I thought it was in a group chat, but I can't find the reference, and I really do not know why I picked up this book. There are a couple books on creativity that I would have put in my reading list before this book. Which isn't to say this book was a bad book, quite the contrary, it is a fun book to read. 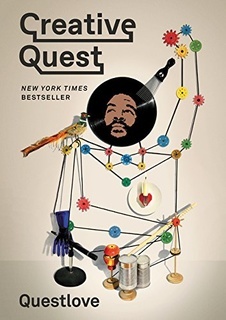 You totally see Questlove's personality in this book, and how much fun he is having. Life isn't all about fun, of course, but if you love your work, love what you do, the rough spots can be endured. This book isn't anything deep, it isn't anything you haven't heard before if you're older than 22 and have been creating in any form. The book is, however, a fun read. It is a good "rah rah rah!" book. It is a good "keep it up!" book. It is a good "you got this!" book. If you're not stuck stuck, but are maybe a bit stuck, and want to distract yourself, tell yourself you're moving ahead by reading a book on creativity, this book is a good one to read. If you're stuck stuck, shut up, stop reading, and go do the work. If you can't create, you can at least do the work. I enjoyed reading the book, and recommend my style of reading books like this: listen to the audio book when you're walking outside, running, doing dishes, knitting, and read the actual book when you have the time to sit and read or are walking on the treadmill reading. Be receptive. Be ready to hear your future in a parking lot behind a Pharcyde concert or at a church in England. This makes more sense in the context of the book, actually. Here comes the final fundamental point of this section: Be sure to summarize what you’re learning. Isolate your insight and turn it into a short thesis statement. This is a way of most learning: actively play with the knowledge to make it your own. That's what all the exercises at the end of the chapter are about. Where creativity is concerned, pure originality is at least partially a myth. People are heavily invested in that myth because they have egos, or because they are selling a brand. But it’s not fully real. In the end, one of the most important things to remember about influence is that it’s never the same. Time changes artists, and time changes the art they make, and time changes the way they look at the forces that shape that art. He made everyone around him feel that he was genuinely in awe of who they were as a person and an artist. He was able not only to acknowledge that he was giving you creative energy, but to behave as if you were giving him energy. Whether it was sincere or strategic, this reversed the circuit. It made him young again in some way, made you older, but also made you question the entire hierarchy. It was, in its own way, extremely cool, and extremely motivational. I was re-creating a person who had re-created me, and I couldn’t even be me as well as he had. Play it backward. We see things one way, mostly. We are at the mercy of common paradigms. That’s why conventional wisdom has such a hold on us. Embrace conspiracy, just for a minute. This exercise is something different. Take a piece of art that you love and invert it. If it’s a painting or a photograph, it’s easy. Just turn it upside down. Backward asks all questions, and answers them, too. Random plucking This is a related strategy, but for it you’ll need a specific kind of book: a dictionary. Open it up to a random page and see what you can do with it. Collaborations work best this way, when there’s a mutual desire to see what the other side adds. You know that what you’re making on your own has value, but the sum is more than the parts, and every part knows it. I'd almost argue that it ONLY works this way, it's a fight when it doesn't. ... cognitive disinhibition, and how a Harvard psychologist developed a theory that creative people filter the world around them differently, or rather less. They see too much. It gets in their head. They then have no choice but to make things. For bits of both artists to survive into the final product, they need to make themselves visible to one another, and to themselves. Every successful collaboration is also a fight for your own creative life. It can be difficult to deep-dive inside yourself and figure out all the things about you that work and don’t work, let alone the things that work and don’t work in collaboration with someone else. Be receptive to ideas that sound strange. Maybe be receptive to those ideas especially, because the tendency is to be dismissive. When you give a fair hearing to a strange idea, you might loosen up your own idea to the point where it’s significantly improved. One special form of communication is praise. You don’t have to be insincere about it. No one likes to have smoke blown at them. But you can be honest about what is working in the creative process. The most common problems in collaboration, in my experience, revolve around resentment. Collaborations, even those that are pleasant in the process, can be unpleasant in the product. Just make sure that everyone’s clear. Oh, and get to meetings on time. Oh wow yes. Don't disrespect others by arriving late. This is a thornier issue, and potentially a more profound one: collaboration can not only allow you to place yourself in close proximity with other creatives and watch what happens, but it can fundamentally change you. Reading is a different experience than when we were young — each word offers the possibility for linking out to something else, and the main text just doesn’t have the same gravity it once did. Foreman noted that while our minds hold more information than before, they are more than ever a series of connections to information outside of our minds. Everyone agrees that creativity is a privileged form of thinking. If a question comes into perfect focus, answering it isn’t a creative act anymore. It’s more a matter of information retrieval. The Internet, if you believe Foreman, if you believe Carr, is a menace to creative questioning. The second a question comes into view, the research process starts. We begin our research, our search for facts to satisfy questions, almost immediately. I have personally noticed the way that research sprints ahead of idea formation. Creative minds know and remember a lot, but that also means that they have to know, and remember, selectively. One of the things that’s being lost, along with the ability to really focus and concentrate on the bottom of that well, is the ability to establish hierarchy, a confident sense of knowing which events (or ideas) are the big planets and which ones are the small moons orbiting around them. It wasn’t that he couldn’t go back to the well. He went back there. But when he went back, it was dry. He’s talked plenty about that period. His first album had summed up everything that he thought and felt. He had found a way to express his entire soul. That’s why they call it soul music. A.k.a. "he had one story to tell." I think that his block was more about having emptied out the tank in a very comprehensive and exhausting way, then promoting that album around the clock for two years. It was difficult to get other things to float to the surface. So he did the next best thing, or rather another best thing, which is to make something that is already made. I recommend this to any creative person in any discipline. People with limited ideas of things call this cheating. It’s not. It’s inspired imitation. Making your own version of existing works keeps you on your toes. It keeps your machinery humming along. When I think about its effect, I think I can distill it down to one short, sharp piece of advice: change your materials. Material changes matter because they change the process of creative production. I stop. I shut the computer, or at least shut my eyes for a second so that I can’t feel the computer. I let the distraction become boredom. And when the distraction shifts into boredom, that’s the seed of something creative. On the face of it, that doesn’t make sense. Boredom seems like the least creative feeling. It seems like a numbness. But it’s actually a way of clearing space for a new idea to spring back up. But Brodsky has a trick up his sleeve. He says that when you realize you’re insignificant, you can start feeling two things: passion and pain. Passion is the way you fight meaninglessness. If you were significant, you wouldn’t necessarily need passion at all. You could just sit back and experience things as they came. And pain is the acceptance of the truth of that insignificance. Boredom, that sense of being disconnected, is what makes you bounce back with a renewed commitment. That’s what Brodsky was saying about Wilson Pickett, even though he wasn’t talking about Wilson Pickett at all. Let yourself go to the sense of being disconnected and meaningless. Let it wash over you and drown you a little bit before you come up gasping for air. Creativity is a fight against that insignificance. Whatever your personal preference, no matter how significant or how trivial, if it’s a source of pleasure, and in denying yourself that pleasure you’ll be entering a state where you think about it all the time, then you are working against your own creativity. You might think certain things are a distraction, but going without them can become a larger distraction if you are thinking all the time about the time when you will be returned to them, or them to you. Make your environment reflective of your tastes. Eliminate distractions, including the distraction of being without any of the distractions you need. The first and most obvious effect is that technology drives a stake into the heart of originality. Late in the set, as people are getting worn out, I’ll downshift to a slower song. But not just any slower song — Phil Collins’s “In the Air Tonight.” Everyone knows the song, but think of how it starts: Daryl Stuermer, who played guitar with George Duke, playing that buzzing chord, and Collins layering up keyboards and drums. But the moment everyone knows is later, when the crashing rubbery drums come in: da-dum, da-dum, da-dum. Collins got the effect by playing while the talkback circuit was still activated—it’s the technique I outlined in an earlier chapter, being open to the possibility that the accidents might be better than the plan—and then Hugh Padgham, his coproducer, recorded it using compressed and gated microphones. It’s the sound that drives an audience crazy. Okay, I am dying at this point because as I read this part of the book, this video came out, and I am DYING LAUGHING. You have to throw things away so that there is some value implied by the act of keeping other things. On a podcast I heard the comedian Kate Micucci talking about how when she was young, and an aspiring visual artist, she used to go to museums often. She said something about standing in front of paintings. She said she didn’t give them all the same amount of time. How could she? That’s not how you visit a museum: stand in front of work 1, count to twenty, stand in front of work 2, count to twenty, repeat until dissatisfied. No: you should go through a museum at a clip until something demands your attention. Keep on the move until you are asked by a work to stop moving. The goal of creativity may be to learn to present yourself to others, in part, but it’s not to present yourself at the expense of truth. The second you become your own product, you’re heading down a chute rather than up a ladder. I want to suggest a correction: for every hour you spend doing something, spend at least a few minutes doing something unrelated. That’s Questlove’s corollary to Gladwell’s Ten Thousand Hours. Getting into a groove can be dangerously close to getting into a rut. There are many stresses in the creative life, so it’s important to limit the self-inflicted ones. Bert gets to see how his work is experienced both from the inside and from the outside. He gets to look at it as a creator and he gets to watch others immerse themselves in it. That’s the tension that needs to be preserved for good creative art. Never forget that you are working for your own satisfaction, but also never forget that others will occupy the creative work that you have made. Both perspectives need to exist in your mind all the time. Commercial art has another great component, which is the deadline. When you’re making something for yourself, how do you know when it’s done? Sometimes you don’t. And some of those times you don’t even want to know. The process is what is nourishing you, and to bring it to a close would defeat the point. But enthusiasm isn’t the same as organized and productive critical feedback. Dave said that in the restaurant business, there used to be a very well-understood process. You would voice your displeasure to your server, who would in turn tell the chef or the owner. Sometimes the chef or owner would come out and address the diner’s concern, or at least assess it. Sometimes there would be an apology. Sometimes the meal would be comped. “No one likes a bad review,” Dave said, “but that kind of dialogue is something that everyone got used to.” Online commentary doesn’t require any of that. An unhappy customer can pay his bill, leave, and then rant and rave about the restaurant hours later, from his home. The restaurateur has no way of hearing the complaint in a way that allows him to do anything about it—at least for that customer. This. Wow, so much this. There are at least two lessons to take away from stories of failure. The first, of course, is not to be afraid of it. Any career, if it is to be a long career, includes a mix of successes and failures, and it should. That mix is oxygen-rich. It keeps you breathing. What does failure do to an artist? It can mess with your head. That’s primarily because it’s only ever in your head. The things that are hailed today may be forgotten tomorrow. The reverse can happen, too. A work stamped one way doesn’t stay that way. Some works are deemed masterpieces and exist in that rare air forever, but usually this designation passing down through time unchallenged, unrevised, and unrevisited is the result of a shortage of thinking on the part of audiences, the result of a preference for received wisdom. Failure is not fatal. For starters, it can be a motivator. Smooth sailing isn’t always the best way to convince yourself to put your nose back to the grindstone. Creative failure leads to a similar liberation. Failure is sometimes in your mind. Sometimes it’s in the eye of the... well, not the beholder, exactly, but the afflicted. Even when it’s not, even when it’s indisputable, it’s never the end. The only correction I’d make to this formula is that true creative people don’t walk away from it, not exactly. They walk toward the next thing. But success, if misunderstood, can be just as dangerous as failure. But don’t let success knock you down, either. It can put you in a narrow lane and make you afraid of experimentation. And this would be Apple, unwilling to experiment because they are afraid of failing. There are two related issues here, so let me separate them for a second: there’s fear of being held above the community that has supported you, and then there’s fear of losing the context of those similar artists. For me, those two things combine to create a specific insecurity. You need to be aware of the nutritional benefits of failure and the empty calories of certain kinds of success. But I want to end with one more point, and it’s also a philosophical one. One of the best ways that you can cope with the feelings of failure (or the stresses of success) is to embrace a simple fact: the world mostly doesn’t care about you. If you put out a record and fewer people buy it than projected, if you write a book and it sells worse than you had hoped, even if you tweet out something funny and it doesn’t get the likes and retweets that you’ve grown accustomed to, you might have the tendency to panic or feel especially bad about yourself. Don’t. Feel good about it. You’re getting back the gift of freedom. People’s silence, or an audience’s distance from you, isn’t necessarily a negative review. The world is extremely cluttered. Creativity needs a certain amount of isolation to improve your ability to understand connection. Creativity needs a certain amount of indifference to improve your ability to make a difference. Creativity needs a certain amount of void so that you can be (and create) content. When he can’t reach them, he doesn’t admit defeat, but instead starts claiming that the grapes were sour in the first place. This fable is, in the end, the only one when it comes to setting your creative course and staying on it. If you start thinking the grapes are sour, you’ll ruin the entire process. The grapes aren’t sour. The grapes are sweet. And you may never reach them the way you want. But it’s always worth it. Keep going. Don’t give up. Find new ways in. All those clichés were true in the days of Aesop, when foolish foxes wouldn’t heed them, and they are true today. When it comes to the process, just persist, persist, persist. It has positive effects for your ideas, but also for the entire human machine that produces those ideas. Remember: life is short. If you waste time or you turn away from the business at hand, you’re going to regret it. But life is also long. And part of persisting is coming to terms with that fact. Brodsky was speaking to college grads, and he was telling them to get accustomed to the idea that they wouldn’t always be jazzed or juiced by what they were doing. The sooner they got their heads around that idea, the sooner they could accept boredom. And accepting boredom meant accepting a series of other things—the realization that humans are insignificant on the planet, for starters, which leads to the realization that humans must create to ward off that insignificance. Maintaining the right attitude about aging, and keeping your creativity charged as you age, is the flip side of that same principle. He warned against acknowledging the ways in which age limits your movement through the world. Specifically, he urged older people not to stop going down a flight of stairs just because it hurts a little. Once you start stopping, you’re on your way to shutting down entirely. Little creative hitches and hurdles may come up at any time. But age is a different version of the same problem, because it’s easy to get the sense that things are beyond your control. That guy was right, and also he was wrong. The way he was both right and wrong is what creativity is all about. It’s about finding your own unique way of fitting into the continually repeating human experience. Nothing you do is new, but you can still be new within that realization. An afterword is a strange goodbye, a place for the author to offer parting thoughts but also to remind readers that the book should stay with you.